As a traditional alpine town rather than a purpose built ski resort, Morzine offers an extensive variety of things to do for non skiers, or those taking a break from skiing or snowboarding. Enjoy indoor activities like browsing Morzine’s boutiques, being pampered with a massage, or having a dip at Morzine’s impressive new swimming pool and spa complex. Our suggestion of outdoor activities includes stunning alpine walks, snow shoeing, snowmobiling or even a helicopter tour. All Simply Morzine guests can have as much fun off the ski slopes as they do on them and that’s without mentioning the brilliant and varied après ski! Morzine’s swimming pool complex, Parc des Dérêches, has a 25 metre pool, large children’s pool and paddling pool. An adult-only area offers saunas, steam-rooms and a relaxation room. Ice skating – indoor in the Skoda arena and outdoor in the town square. Watch Morzine’s ice hockey team, the Penguins, who play in the French premier league. Aquariaz in Avoriaz is a tropical-themed leisure pool with a lazy river, flume, water playhouse, paddling pool, large pool with climbing walls, massage benches and an open air spa. A number of places offer beauty treatments and massages in Morzine, including Morzine Massage. They come directly to your Simply Morzine chalet or hotel to provide a variety of massage therapies. Weekly visit to the Morzine cheese dairy at the La Fruitière l’Alpage. During this free tour you can see how the team work to produce the local cheese. Weekly visit to the Morzine working slate mine. Visit our neighbour’s wood-sculpting workshop. Local library with occasional art and other exhibitions. Morzine has an excellent range of shops and boutiques. Alongside the many ski and snowboard equipment shops, you’ll find places to buy local cheeses, charcuterie and hams or artisan-made chocolates. Morzine’s weekly market (Wednesdays) is another great spot for Savoyard produce. Morzine offers a wide variety of bars, cafés and restaurants with everything from a quick coffee to a fine dining experience. All Simply Morzine chalets and apartments are equipped with UK Freesat TV. We offer a hard drive media player with DVD library and of course, a selection of traditional games. These always prove popular on a ski holiday! There are well marked walking trails at resort level, along the valley, further up the mountain or alongside the ski slopes. A Tourist Office guidebook highlights the best trails and pedestrian passes can be purchased to explore the higher mountain. All-terrain mountain buggies can be hired for young children. Snow shoeing, including organised snow shoe walks with a meal in a mountain refuge. Hire snow shoes from Felix Ski, our local ski shop, or explore the mountain with a local guide. Nordic walking, this total body activity is done with specially designed walking poles you can hire. A guidebook details Nordic walking routes. A number of local guides are available to take you on trails off the beaten track. Morzine offers five different cross country skiing areas. Access to cross-country trails is free throughout Morzine and Avoriaz, although a pass is required to use the lifts to access the Nordic sectors up the mountain. Equipment can be hired or bought in most ski shops in Morzine. 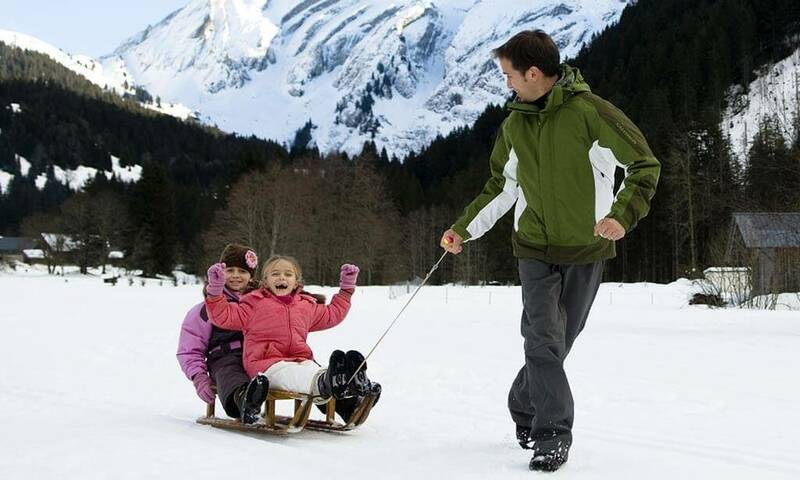 Sledges are available free of charge at Felix Ski shop to Simply Morzine guests who have hired their equipment from the shop. Morzine’s specially designated sledging area is conveniently located immediately behind Felix! Explore the resort using a segway; introductory sessions, guided tours and adventure session are all available from local companies in Morzine. The Wednesday morning local market in Morzine offers a huge variety of local Savoyard produce, including cheese, charcuterie, chocolates, clothes and jewellery. Weekly Morzine guided heritage tour (in French). Horse and cart rides through Morzine. Visit the Tourist Office – they often run various events, including activities for children like clowns, games and face-painting. Get a different perspective of the mountains with parapenting/paragliding and speed riding, which combines paragliding and skiing. A number of courses and one off introductory sessions are available in Morzine. Snowmobiling tours of the mountain with experienced guides. Day time and evening sessions are available. Heli-skiing and helicopter flights. Heli-skiing is done with professional mountain guides, with drop offs in Switzerland or Italy. Several descents are possible per day. Go ice diving and discover the marine life in Lake Montriond. Suitable for divers of all levels. Ski Joëring is a winter sport where a person on skis is pulled by a horse, a dog (or dogs) or a motor vehicle. Yoonering is an innovative sledging technique that involves sitting on one ski. Mountaineering and ice climbing sessions are provided by a number of companies in Morzine. Allowing you to explore temporary ice-falls or ridge routes, and discover the thrill of mountain climbing in winter.